Cave houses are still in use in parts of Cappadocia, Turkey. 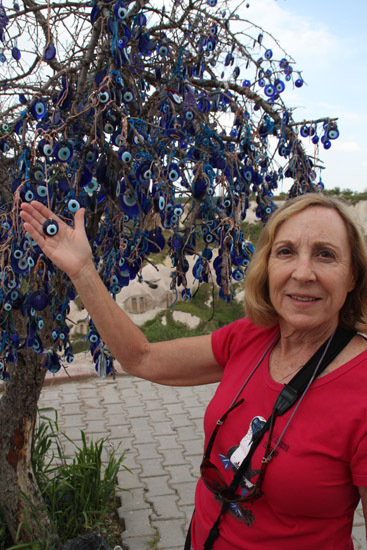 When we booked our Oceania cruise sailing from Istanbul, Turkey to Lisbon, Portugal, going to Cappadocia wasn’t on our radar. But it’s one of the most amazing areas, both for its incredible landscape and its long history. Here's why you should consider a visit to Cappadocia, too. After arriving in Istanbul we flew to Kayseri, a city in the center of Asia Minor, the cradle of civilization. The first settlement of humanity dates back to 8000 B.C., although 32 different civilizations have lived there over the centuries. Kayseri is one of the richer cities of Turkey because of trade, most importantly with handmade carpets, which are the pride of Turkey. Caps are easily seen on these fairy chimneys. 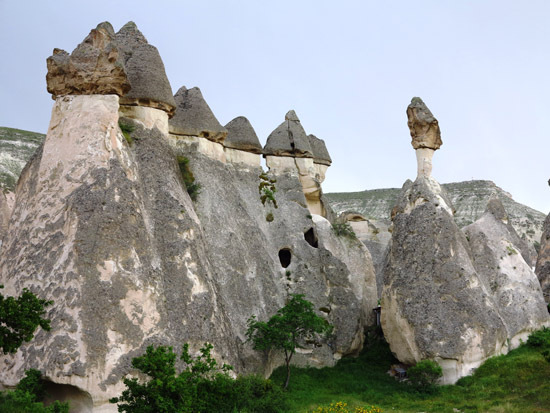 The unusual, unearthly landscape of Cappadocia is the result of early eruptions of Mt. Aegis, which put volcanic ash into the soil. Weird landscapes have resulted in “fairy chimneys,” basalt formations that have not eroded like ash. In varying shades of gray and tan with rock strata often visible, some fairy chimneys have dark-colored pointed triangles on top called caps. These are almost totally basalt and protect the yellow part, which is volcanic ash, from eroding. The cap may fall down causing the death of a fairy chimney, but then a new chimney starts to grow from it, so it’s an ongoing process. Because the rock is soft, people in ancient times (around 2000 B.C.) carved homes and churches in the ash using only their primitive tools. hot air balloon ride--so intriguing. Early one morning we went for a hot air balloon ride. More than 30 balloon companies fly up to 150 balloons on any given day. Because of rain and thunder the previous night, some had canceled, but the morning turned out perfect: clear and sunny with a slight breeze. Balloons of all colors and designs filled the sky as we drifted toward the valley, between rock walls, and over fairy chimneys in a spectacular ride. It’s a great way to see layers of multi-colored rocks that give a clear picture of the geology of the area. Volcanic spires and pinnacles, craggy cliffs, and cave houses glowed in the soft morning light. The land is fertile, so we saw many green patches under cultivation (we landed in a farmer’s field) despite an eerie, desert-like feeling in the area. During our three-day visit we toured a variety of places that I’ll describe in more detail in future articles. Avanos is locaed on the Kizilirmak River which provides red clay used to make Turkey’s famous pottery and tiles for the Blue Mosque. 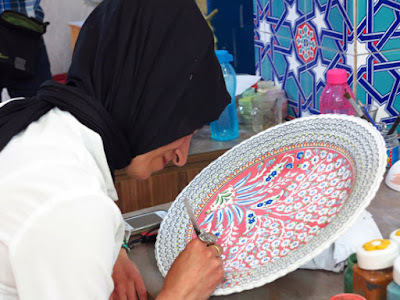 Each piece is carefully crafted and hand-painted, often taking months to complete. the 9th to 13th centuries. Carpet making is a skill in danger of dying, so the Turkish government sponsors schools to teach young women how to knot fine carpets from silk, wool, cotton, or combinations of natural materials. We saw this in action at Martis Turkish Rug School and factory. 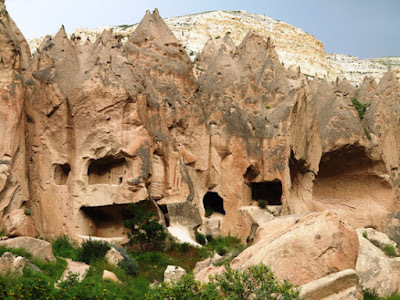 At Goreme, more than half of the population lived in rock houses and fairy chimneys until 10 years ago, when the government decided that was not a proper place to live. Goreme Open Air Museum has some of the best preserved examples of cave churches, most quite small but decorated with fading frescos and paintings directly on the rock walls. 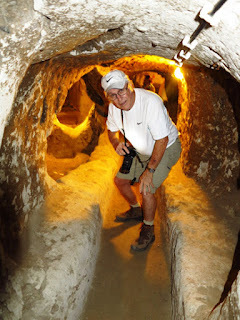 Another example of how important the rock landscape was to early Turks is found at Derinkuyu, an underground city which could house 10,000 people for up to six months during times of war. I bought trivets and a few other souvenirs at Pigeon Valley, which gets its name honestly from the thousands of pigeons there. 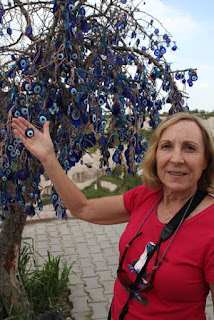 Trees sparkle with blue “evil eye” trinkets, supposedly good luck charms. Throughout Cappadocia we observed lots of poplar trees, which are used to make furniture. When a son is born, the father plants a poplar tree as an investment for the son’s future education or wedding. We made a photo stop at Zelve, an important settlement and religious area between the 9th and 13th centuries. It once spread over three valleys and contains numerous pointed chimneys with large stems. It’s now abandoned since unstable formations make it too dangerous for people to live there. At the end of our tour we flew back to Istanbul from Nevshehir, a city with a small airport used primarily by tourists. 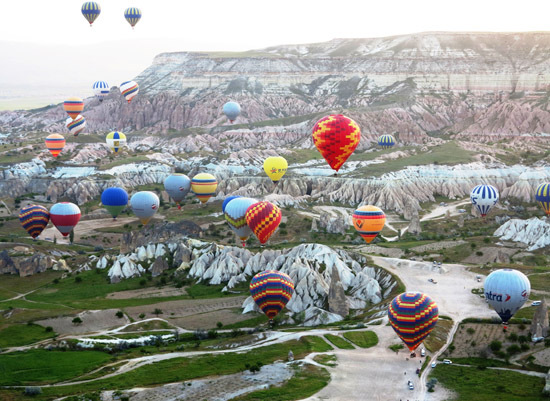 Cappadocia (pronounced cap-a-dok-i-a) is unlike anything we’ve ever seen, and I’d highly encourage visitors to Turkey to include it on their itineraries.